"I’ve made $44,917.42 in revenue in the past 18 months exclusively as an independent touring musician without a fan base. Over that time I played 249 shows, taught 91 lessons, and did other musical jobs for cash. After all business and nonbusiness expenses, I profited around $14,000. I bought a used car because my tour vehicle was nearing its final days. I put the rest in a savings account. 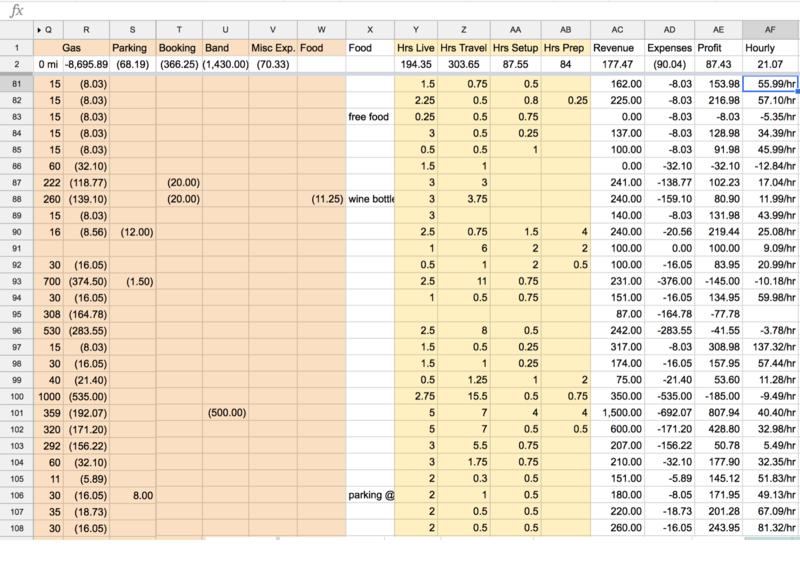 There’s nothing particularly glamorous about my financials, but enough people have asked me to help them through theirs that I thought I’d publish my strategies. Here are some tips to keep your finances in order so you can tour profitably. 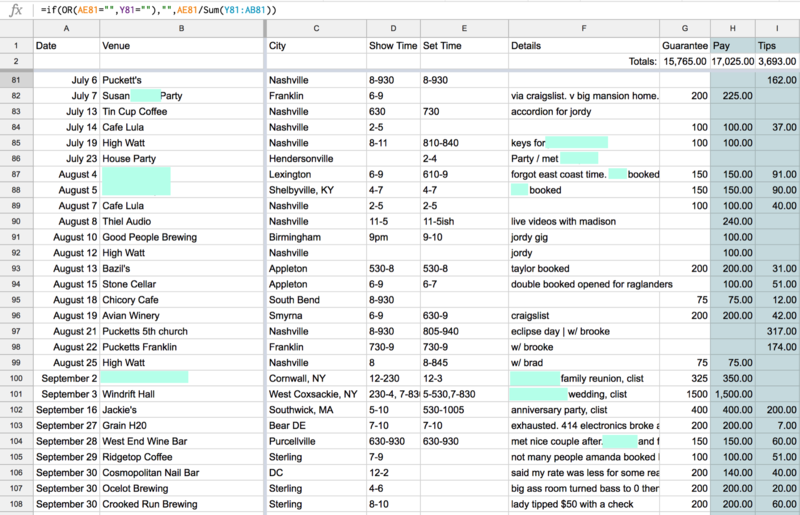 Keep a detailed excel spreadsheet with all money in, out, and between. 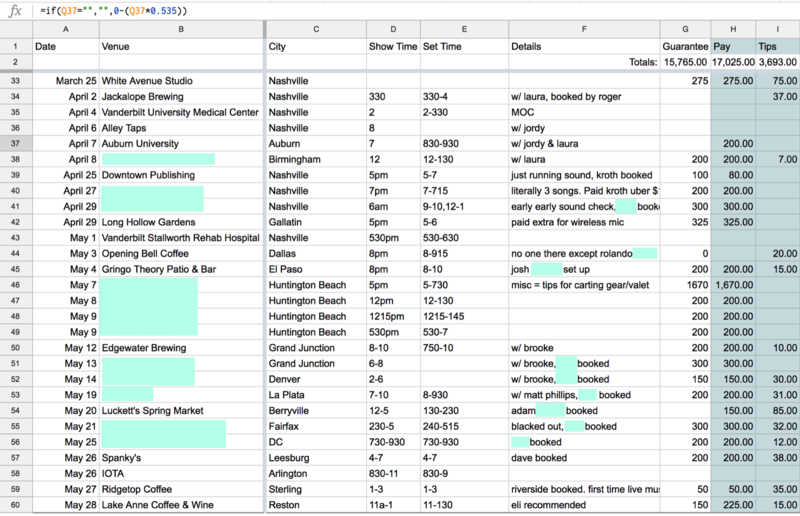 It’s useful to track how many hours you put towards each gig, so you know which shows end up being worth your time. Do this for all of your revenue streams (I had sheets for gigs, merch, royalties, private lessons, session work, rehearsals, and writes). You shouldn’t have to pay taxes this year. If you do, congrats – you must be doing pretty well. When claiming business expenses, you can legally write off virtually every dollar you spend on tour. Take pictures of receipts. You can write off 50% of every meal, and 100% of all food that you eat while actively working. If you donated unneeded belongings before leaving home, write it off. Goodwill usually lets you self-report the value of your donation. Don’t itemize anything car related – just count your miles. Because highway driving requires less maintenance per mile than average driving habits, you’ll save money on taxes. 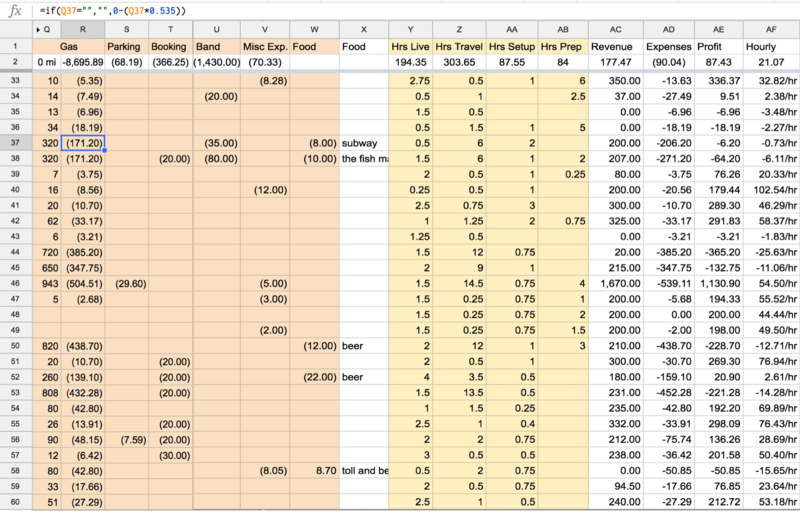 Your personal objectives with touring should predicate your finances on tour. If you’re looking for touring to be your primary means of income, be conscientious and budget for big expenses like car maintenance and new gear months in advance. If you’re just looking to explore the country for a few weeks and offset some of your expenses, profiting isn’t a necessity. Successful tour prep is making a plan that works for you and your goals."